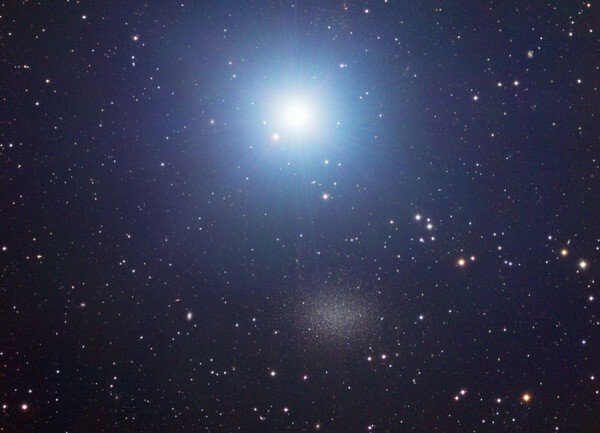 Alpha Leonis, better known as Regulus A (I know someone who knows and remembers an area in Star Trek Online game called so, just this star) is the brightest star in the sky. It is located about 80 light years away in the constellation Leo. Together with Regulus A, he is a very famous double star called Regulus and D, as in the picture you can see a little lower left of the brightest (own Regulus A). By size is believed to be a white dwarf 0.3 times the size of our sun. The orbits, the time it takes to roll over each other, is 40 days, quite large. The most that can be said about this duo is that they are at the point of Kepler and that their orbits so fast, meet the third law of Kepler orbits which makes the stars (Regulus and Regulus D) are distorted by gravity between them and at one time (millions of years, quiet) falling over each other, usually on Regulus D.
Just below is a galaxy / star cluster, Leo I, about 800 thousand light years, we will take more than the bag here.